This e-mail came to me today through pilot channels. I fly internationally quite often, and am sharing it for the benefit of those of my readers who do the same. Non pilots forgive the technical jargon and read through it to get to the systemic problems that this guy points out. His experience is exactly what has been rumored for years and why I did not apply for a Sim Instructor job with KAL when I retired from AA. Our B777 Fleet manager (also retiring) had just been hired to start their training program and was recruiting AA pilots that had 777 type ratings. Thankfully NetJets came along instead. If you forward this, please remove my email address and comments. Enjoy your flight on Asiana..
After I retired from UAL as a Standards Captain on the B747–400, I got a job as a simulator instructor working for Alteon (a Boeing subsidiary) at Asiana. When I first got there, I was shocked and surprised by the lack of basic piloting skills shown by most of the pilots. It is not a normal situation with normal progression from new hire, right seat, left seat taking a decade or two. One big difference is that ex-Military pilots are given super-seniority and progress to the left seat much faster. Compared to the US, they also upgrade fairly rapidly because of the phenomenal growth by all Asian air carriers. By the way, after about six months at Asiana, I was moved over to KAL and found them to be identical. The only difference was the color of the uniforms and airplanes. I worked in Korea for 5 long years and although I found most of the people to be very pleasant, it’s a minefield of a work environment ... for them and for us expats. One of the first things I learned was that the pilots kept a web-site and reported on every training session. I don’t think this was officially sanctioned by the company, but after one or two simulator periods, a database was building on me (and everyone else) that told them exactly how I ran the sessions, what to expect on checks, and what to look out for. For example; I used to open an aft cargo door at 100 knots to get them to initiate an RTO and I would brief them on it during the briefing. This was on the B-737 NG and many of the captains were coming off the 777 or B747 and they were used to the Master Caution System being inhibited at 80 kts. Well, for the first few days after I started that, EVERYONE rejected the takeoff. Then, all of a sudden they all “got it” and continued the takeoff (in accordance with their manuals). The word had gotten out. I figured it was an overall PLUS for the training program. We expat instructors were forced upon them after the amount of fatal accidents (most of the them totally avoidable) over a decade began to be noticed by the outside world. They were basically given an ultimatum by the FAA, Transport Canada, and the EU to totally rebuild and rethink their training program or face being banned from the skies all over the world. They hired Boeing and Airbus to staff the training centers. KAL has one center and Asiana has another. When I was there (2003-2008) we had about 60 expats conducting training KAL and about 40 at Asiana. Most instructors were from the USA, Canada, Australia, or New Zealand with a few stuffed in from Europe and Asia. Boeing also operated training centers in Singapore and China so they did hire some instructors from there. This solution has only been partially successful but still faces ingrained resistance from the Koreans. I lost track of the number of highly qualified instructors I worked with who were fired because they tried to enforce “normal” standards of performance. By normal standards, I would include being able to master basic tasks like successfully shoot a visual approach with 10 kt crosswind and the weather CAVOK. I am not kidding when I tell you that requiring them to shoot a visual approach struck fear in their hearts ... with good reason. Like this Asiana crew, it didn't’ compute that you needed to be a 1000’ AGL at 3 miles and your sink rate should be 600-800 Ft/Min. But, after 5 years, they finally nailed me. I still had to sign my name to their training and sometimes if I just couldn’t pass someone on a check, I had no choice but to fail them. I usually busted about 3-5 crews a year and the resistance against me built. I finally failed an extremely incompetent crew and it turned out he was the a high-ranking captain who was the Chief Line Check pilot on the fleet I was teaching on. I found out on my next monthly trip home that KAL was not going to renew my Visa. The crew I failed was given another check and continued a fly while talking about how unfair Captain ______ was. Any of you Boeing glass-cockpit guys will know what I mean when I describe these events. I gave them a VOR approach with an 15 mile arc from the IAF. By the way, KAL dictated the profiles for all sessions and we just administered them. He requested two turns in holding at the IAF to get set up for the approach. When he finally got his nerve up, he requested “Radar Vectors” to final. He could have just said he was ready for the approach and I would have cleared him to the IAF and then “Cleared for the approach” and he could have selected “Exit Hold” and been on his way. He was already in LNAV/VNAV PATH. So, I gave him vectors to final with a 30 degree intercept. Of course, he failed to “Extend the FAF” and he couldn’t understand why it would not intercept the LNAV magenta line when he punched LNAV and VNAV. He made three approaches and missed approaches before he figured out that his active waypoint was “Hold at XYZ.” Every time he punched LNAV, it would try to go back to the IAF ... just like it was supposed to do. Since it was a check, I was not allowed (by their own rules) to offer him any help. That was just one of about half dozen major errors I documented in his UNSAT paperwork. He also failed to put in ANY aileron on takeoff with a 30-knot direct crosswind (again, the weather was dictated by KAL). 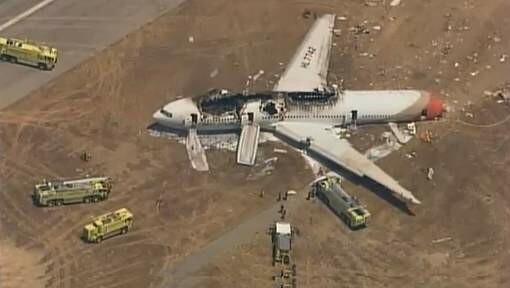 This Asiana SFO accident makes me sick and while I am surprised there are not more, I expect that there will be many more of the same type accidents in the future unless some drastic steps are taken. They are already required to hire a certain percentage of expats to try to ingrain more flying expertise in them, but more likely, they will eventually be fired too. One of the best trainees I ever had was a Korean/American (he grew up and went to school in the USA) who flew C-141’s in the USAF. When he got out, he moved back to Korea and got hired by KAL. I met him when I gave him some training and a check on the B-737 and of course, he breezed through the training. I give him annual PCs for a few years and he was always a good pilot. Then, he got involved with trying to start a pilots union and when they tired to enforce some sort of duty rigs on international flights, he was fired after being arrested and JAILED! The Koreans are very very bright and smart so I was puzzled by their inability to fly an airplane well. They would show up on Day 1 of training (an hour before the scheduled briefing time, in a 3-piece suit, and shined shoes) with the entire contents of the FCOM and Flight Manual totally memorized. But, putting that information to actual use was many times impossible. Crosswind landings are also an unsolvable puzzle for most of them. I never did figure it out completely, but I think I did uncover a few clues. Here is my best guess. First off, their educational system emphasizes ROTE memorization from the first day of school as little kids. As you know, that is the lowest form of learning and they act like robots. They are also taught to NEVER challenge authority and in spite of the flight training heavily emphasizing CRM/CLR, it still exists either on the surface or very subtly. You just can’t change 3000 years of culture. The other thing that I think plays an important role is the fact that there is virtually NO civil aircraft flying in Korea. It’s actually illegal to own a Cessna-152 and just go learn to fly. Ultra-lights and Powered Hang Gliders are Ok. I guess they don’t trust the people to not start WW III by flying 35 miles north of Inchon into North Korea. But, they don’t get the kids who grew up flying (and thinking for themselves) and hanging around airports. They do recruit some kids from college and send then to the US or Australia and get them their tickets. Generally, I had better experience with them than with the ex-Military pilots. This was a surprise to me as I spent years as a Naval Aviator flying fighters after getting my private in light airplanes. I would get experienced F-4, F-5, F-15, and F-16 pilots who were actually terrible pilots if they had to hand fly the airplane. What a shock! Finally, I’ll get off my box and talk about the total flight hours they claim. I do accept that there are a few talented and free-thinking pilots that I met and trained in Korea. Some are still in contact and I consider them friends. They were a joy! But, they were few and far between and certainly not the norm. Actually, this is a worldwide problem involving automation and the auto-flight concept. Take one of these new first officers that got his ratings in the US or Australia and came to KAL or Asiana with 225 flight hours. After takeoff, in accordance with their SOP, he calls for the autopilot to be engaged at 250’ after takeoff. How much actual flight time is that? Hardly one minute. Then he might fly for hours on the autopilot and finally disengage it (MAYBE?) below 800’ after the gear was down, flaps extended and on airspeed (autothrottle). Then he might bring it in to land. Again, how much real “flight time” or real experience did he get. Minutes! Of course, on the 777 or 747, it’s the same only they get more inflated logbooks. So, when I hear that a 10,000 hour Korean captain was vectored in for a 17-mile final and cleared for a visual approach in CAVOK weather, it raises the hair on the back of my neck. The Cessna O-2 Skymaster and "Nail 55"